These step by step notes below I wrote thanks to the information provided in "The Alchemy Key" by Stuart Nettleton. While he assumed the end product would be nothing but gold chloride, that is not the case, which can be proven by the test of transmutation. Chemically speaking this makes no sense, but alchemically we know how nature works and the secret spirit which is contained in the metals, with antimony being the most potent. But this process would fail if commercial antimony trichloride were used, or if you made it by dissolving stibnite in hydrochloric acid, because that would leave out the iron. It is the iron that charges the antimony, and without it, antimony will no be able to produce the Stone. Antimony trichloride works by dissolving the gold through direct chlorine ion transfer. It's a very corrosive and dangerous chemical to work with. More photos will be added to the steps below. This first part is the creation of antimony trichloride, which actually becomes antimony oxychloride when allowed to absorb moisture from the air. Antimony expands when cooling, so it's very tricky to deal with in a distillation system. While it is a beautiful thing to reproduce the experiment the same way the alchemists did hundreds of years ago, you have to decide if it's worth the risk. 1. 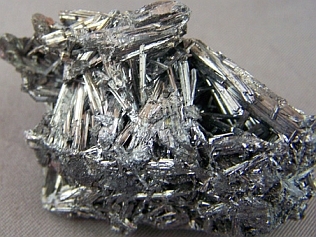 Mix together 3 parts pulverized stibnite (gray antimony sulfide Sb2S3), 1 part iron powder or filing, and 4 parts of the Secret Fire (Potassium Chloride). Put this mix into a 250ml flask that is set up to distill into a 500ml receiver flask. The neck of the flask must be cooler than the base so the vapor of the Mercury will condense. If the neck is warmer, the vapor will expand too rapidly and explode the vessel. Alchemists call their vessels an Iimbic, Alembic, Kerotakis or Pelican. A liebig condenser is best for this operation because crystals may form in the condenser, and a liebig is straight and wide enough to insert tools inside to scrape the crystals. Water cooled with an ice and salt bath is circulated through the condenser using a simple $10 submersible fountain pump from your local pet shop. 3. At the end of the 84 day cycle, seal up the receiver flask at the same time you turn off the heat. 4. 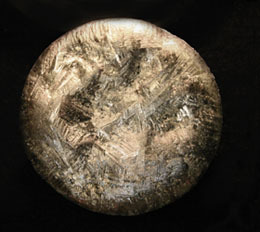 Now the Star Regulus (antimony) inside the flask will be saturated with iron sulfide. Evaporate any remaining water away, and then remove the star from the black iron sulfide mat and pulverize it. Discard any oxide flowers from the neck of the flask and discard the iron sulfide unless you have some other experiment you want to save it for. Pictured below is the regulus which is obtained by heating iron and antimony trisulfide together. This is NOT the *star* regulus; it is merely a normal regulus which is very popular for alchemists to assume is the star regulus. The correct star regulus literally forms a STAR and can only be made when the secret fire (potassium chloride) is also added to the mix of iron and stibnite. This is the ingredient which is kept secret in all alchemy works about the antimony path. When you see old alchemy engravings that show a gray wolf, this is antimony. And when there is also pictured a star, this is representing a process to produce the star regulus, and hence, antimony trichloride. Simply google the phrase "star regulus" and antimony, and you will be amused at all the incorrect theories people write about the star regulus being made from only iron and antimony, and they show this kind of photo below. They are oblivious to the fact the star regulus actually is a perfect star, and they assume they actually understand the alchemy work they are reading, but then wonder why they can't obtain the Philosophical Mercury from this path (antimony trichloride). 5. Now for the second perfection, you will need a 100ml flask with a long vertical condenser tube connected, which can be found anywhere flasks are sold. Qglass.com is a good place. The tube will act as the condenser, and it should be 6 fingers high (about 20 inches). Alchemist's used a rubber bung stopper to seal the flask so it would blow off instead of the flask exploding. You can also use a ground glass stopper. Twist the stopper on tight, and if any pressure builds up too high, the stopper will blow off. (It's essential to do this process outside in case antimony trichloride sprays everywhere.) If you have a hard time removing the stopper, just twist it of with a pair of pliers. Don't be afraid that the glass pennyhead will break off from the stopper. A lot of people foolishly break open the entire flask just because they can't get the stubborn ground glass stopper off. But with pliers, it's actually quite easy. Getting the condenser off the flask will be much harder. 7. Your flask will now be ¼ full. Keep the heat at 99°F. If the reaction doesn't start, increase the heat to 105°F, then turn it back down to 99°F. Vapors will rise and fall, and they will turn from white, to yellow, then bluish and blackish. After that, everything will dry up and burst open into a black mass called the Raven. This part of the process is called the rule of Saturn, and takes 46 to 50 days. 8. Now the rule of Jupiter begins. Slowly raise the temperature to 105°F (the fever). A water will begin to wash the black mass, and the beautiful metallic Peacock's Tail will begin to show. This happens in 56 to 60 days. When these colors appear, it signals the end of the rule of Jupiter. 9. Now the rule of Luna begins. It takes 22 to 24 more days to form the white dove, which will float on the water as a cream. This is the Second Stone. This cream can be gathered and gently heated to evaporate the water, leaving fragrant white oil. This oil was the famous salve or universal unguent of the Knights Templar. It has been of widespread medicinal virtue until the advent of modern pharmaceuticals. The cream cured maladies such as gout, leprosy, stroke, dropsy, epilepsy, consumption and dehydration to fever and pestilence. But if you wish to continue on to making the red stone, leave the white dove in the flask, and don't open it yet. 10. Slowly increase the heat to 150°F and 170°F. The rule of Venus starts and will last for 40 to 42 days. The white dove (the Queen, the Philosophical Mercury) will unite with the golden water (the King). The King and Queen produce the Green Dragon. 11. Now the rule of Mars starts, and lasts 42 days. During this time azure, gray and citrine overcome the Green Dragon, which finally changes to another red Hermetic Mercury. The Earth is red and called ‘Sulphur’. The red Sulphur fixes the white Mercury and they dissolve into a liquid state. 12. The temperature is increased to 212-250°F. This is the rule of Sol, and lasts 40 to 42 days. In a moment the Tyrian color comes. It is a sparkling red oil of fiery vermilion. Alchemists call it the Red Rose; the perfect fixation and perfection; the Red Poppy of the Rock; and the precious tincture. This is at last the Philosophers’ Stone or ‘Third Stone’. When powder forms from the solution, the alchemist slowly increases the temperature to 300ºF.